Launched in 1956, the Alba is a Yawl designed by Philip Rhodes in his study in New York. It was moved to Germany with a freighter to keep on its construction in Abeking & Rasmussen, the prestigious shipyards frequented by the Americans during the post war years, when the medium size regatta yachts became on fashion. In 1978 the yacht became property of a Swiss man who sailed mainly by the Mediterranean. Until 1989 when Ugo Baravalle, a ship collector who even had his own shipyard; became its owner and restored the modifications that the Alba’s suffered during its last 22 years of navigation. 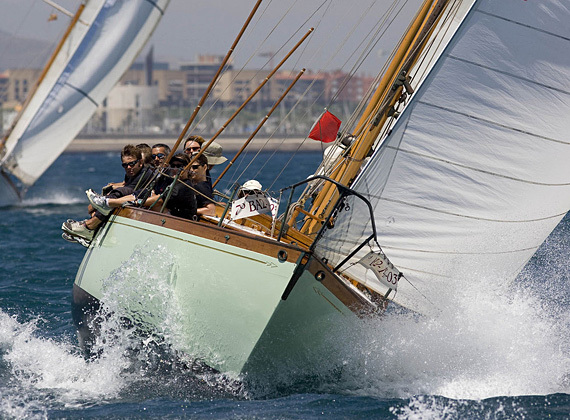 The Alba is one of the last classic yachts conserving its origin pieces. Ironworks, shackles and winches; all of them made of bronze; have been conserved and replaced with original pieces in case of rupture. Alba’s particularities are its folding drift, which helps on its close-hauls and allows to approach the beaches, and its innovative structural system by the time it was built, based on bronze omegas ranging from the board to the hull making it specially rigid. A bow cabin, a bathroom and a central camera with capacity for four crewmembers, constitutes the distribution of this Marconi yawl of 1952 more.